Stakeholders of the All Progressives Congress (APC) in Jos South Local Government Area of Plateau State, have vowed to give President Muhammadu Buhari and Governor Simon Lalong overwhelming support during the February 16 Presidential elections. Hon. Ayuba Pam, spokesman of the stakeholders disclosed this on Monday during a press conference in Jos and vowed not to defect to PDP with Hon. Edward Pwajok, member representing Jos South/Jos East Federal Constituency in the House of Representatives. Pam said they all defected to the APC with Hon. Pwajok in 2017 following the maltreatment of the PDP on them and decribed the returned of Pwajok last week to PDP as a political suicide. “For the avoidance of doubts, we still respect Hon. Edward Pwajok,SAN. We have no doubts about his credibility however, let us say with every sense of responsibility that the latest action he took to return back to the PDP has put his revered credibility into question. “It’s painful to walk with somebody and coming to a point of decision, he abandoned ship. We feel if there was anything concrete to hold unto it shouldn’t have been the reasons he gave. As his political associates we feel betrayed and disappointed. “Let us also make it clear that the Hon member returned alone to PDP. We have resolved to carry on and vowed to ensure total victory of President Muhammadu Buhari, Governor Simon Lalong and all APC Candidates in Jos South LGA. 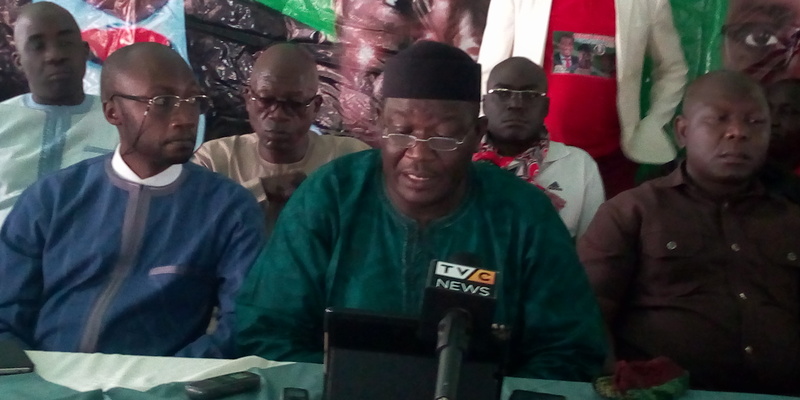 Pam refuted claims by Pwajok that he was not comforted when he lost the APC Senatorial election by the Governor and party Chieftains, saying Governor Lalong and State APC chairman, Hon. Latep Dabang called him severally for a meeting but he refused to pick and the Deputy Governor, Prof. Sonni Gwanle Tyoden had a friutful discussion in his house but decided to defect to the PDP. “Immediately after he failed to secure the ticket of the Senatorial zone, he began to show trends that were peculiar to him and to those who knew his antics, knew that the time was up as he was such a man that never took lightly failure, not even of this magnitude. “He calimed that since when he lost the party’s Senatorial primaries, neither the governor, deputy governor, the state party chairman and the candidate who won the primaries had come to him. He said too, he was being left behind and no body again consulted him about any party activities and he felt he was no longer needed. “No body has enjoyed the closeness and goodwill of the Governor than Hon Edward Gyang Pwajok SAN. Before our decamping, we organized a medical constituency outreached in Vwang where the governor led the entire state executive to grace the occasion. This was a clear demonstration of the love the governor had for him and in the spirit of a by-partisanship attended. “The governor had been more forthcoming calling him and at some point traveling with him to state functions home and abroad, a rear opportunity that he did not get while he served as the State Attorney General for more than eight years.